We run day tours everyday, all year round and evening tours on Wednesdays and Fridays only. Sometimes Tours do get cancelled due to bad weather. We want you to have the best Niagara Falls experience possible! We will reimburse your trip fully if it is cancelled. Where do you pick up passengers? The bus picks passengers up at The Chelsea Hotel Toronto (wait on Gerrard st), 33 Gerrard St W, Toronto, ON M5G 1Z4 at 6:45AM in the Crew Check-In Lobby. Is your hotel not listed here? We can still pick you up within Greater Toronto Area at an extra cost of $80. *Terms & Conditions Apply. Call for details. Free pickups are applicable for Bus Tours & Private Tours only. 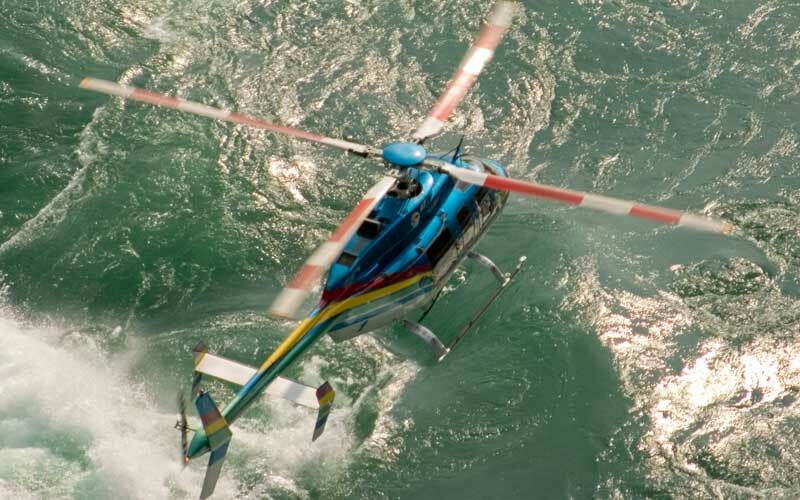 We do not offer free pickup or drop off for Niagara Falls Canada Helicopter Tours. What should I do if I need to change my pickup location? If you need to change your pickup location, please call us at 1-800-653-2242 and we will accommodate you or instruct you of a pickup destination nearby. If I need to purchase a few more tickets for the tour, how do I do that? If you need to purchase more tickets please email us at info@toniagara.com at least 24 hours before your tour date and we will add them to your previous booking. Yes, the Hornblower Boat Cruise is included in your Day Tour Tickets (Adult: $129+tax, Child (4-12yrs): $99+tax) and Evening Tour Tickets (Adult: $139+tax, Child (4-12yrs): $109+tax). 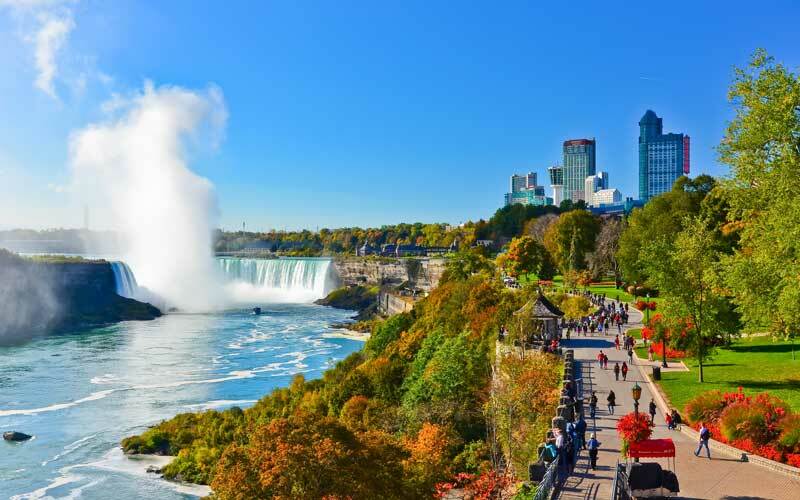 The Hornblower Boat Cruise is an attraction where you board a safe, accomodating Hornblower Boat and journey along the Niagara River past the American Falls, the Bridal Veil Falls and into the very heart of the majestic Canadian Horseshoe Falls. The boat tour takes you as close as possible to the Niagara Falls, it is a terrific photo opportunity! Do I need a Passport or USA VISA to go onto the Hornblower Boat? No, the Hornblower Boat stays on the Canadian side you do not need a Passport or USA VISA to board the boat. Does the Hornblower Boat Cruise (formerly called Maid of the Mist) close in the winter? Yes, the Hornblower Boat Cruise does close for the winter on December 1st (date may change due to winter temperatures). If the Hornblower Boat Cruise is closed, you will tour the Skylon Tower instead. Does my infant eat and travel for free? Yes, children under 3 years of age eat and travel for free. Are there age limits for any of the attractions you visit? No, there are no age limits for any of the attractions on ToNiagara Day or Evening Tours. I want to stay overnight in Niagara Falls or Niagara-on-the-Lake, can you pick me up the next day? Yes, You can stay over at the Niagara Falls or Niagara-on-the-Lake and we will pick you up the next day. We will pick you up from the Niagara Falls hotels at 2:30 p.m. or Niagara-On-The-Lake at 4 p.m.
A Day Tour is approximately 9.5 hours; you are picked up between 8:30-9:30 AM and dropped off around 7:00 PM. An Evening tour is approximately 9.5 hours. Pick-up is around 1:30-2:00 PM and you are dropped off at around 11:30 PM. It is a good idea to bring a light rain jacket, the power of Niagara Falls generates a fair amount of mist. We recommend wearing running shoes. Dress in layers, that way if you get too warm you can remove clothing. It is recommended that you take your smartphone with a camera or any camera so you can capture the memories of Niagara Falls! Is lunch/dinner included on the tour? Lunch is a recommended add-on. A day tour including lunch will cost $164 for Adults and $119 for Children between 4-12 years old. An evening tour including dinner will cost $174 for Adults and $129 for Children between 4-12 years old. Children under 4 years old eat free. Lunch or dinner is not included on custom tours, customers will usually book reservations in advance when on a custom tour. Niagara Falls has many restaurants to choose from. You will have plenty of time for lunch on your own during the 3 hours of free time. Optional: Book a Tour with Buffet Lunch at Fallsview Restaurant, Sheraton on the Falls. Where will we eat lunch (which restaurant)? Lunch (for day tours) and dinner (for evening tours) is served at The Fallsview Restaurant on the penthouse level of the Sheraton on the Falls Hotel. 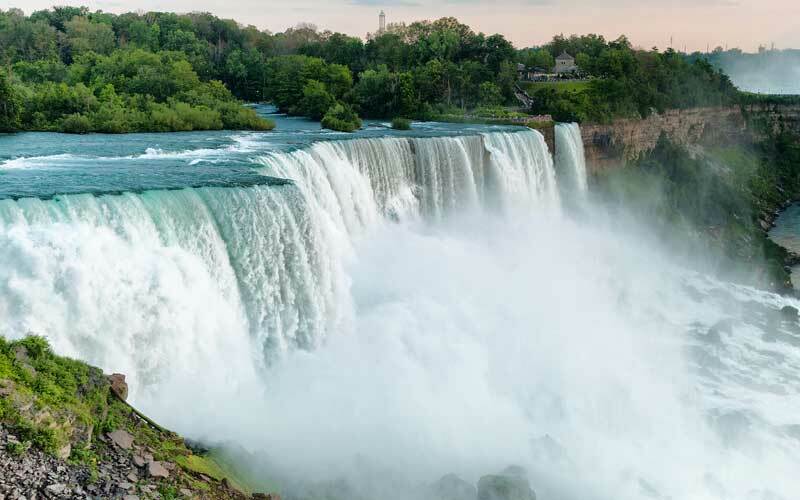 Admire the spectacular aerial view of the Niagara Falls while eating a lavish meal at the all you can eat buffet. What food is available at the buffet? IThe buffet has a large assortment of fruits, vegetables, meats, soup, pasta etc. to accommodate most diets. Do we have time to explore the Niagara Falls area on our own? Yes, you have approximately 2 hours to explore the Niagara Falls area on your tour, this time is reserved for lunch at the buffet. If you eat lunch at the buffet (which we recommend) you will have approximately 1 hour to explore the Niagara Falls area. Many people like to stroll around Clifton Hill shopping and sightseeing. 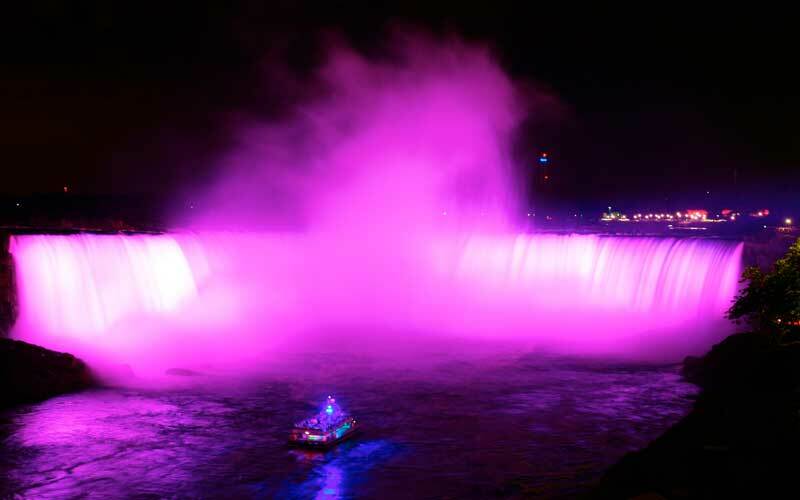 I want to stay in Niagara overnight. Can I be picked up in the morning? After the tour if you want to stay overnight, we will pick you up the next day from your Niagara Falls hotel or Niagara-On-The-Lake Hotel. There is an extra charge of $59 that will be charged to the card used to book the tour online. We will pick you up from the Niagara Falls hotels at 2:30 p.m. or Niagara-On-The-Lake at 4 p.m.
Can you drop me off at Pearson International Airport after the tour? How will I know that there will be fireworks on the evening of my tour? Fireworks begin at 10PM on May 18-21 and 25-28, all of June, July and August, in September every Friday, Saturday and Sunday. You can book an evening tour to correspond with one of these dates. Evening Tours are conducted every Wednesday and Friday beginning in May. If, for any reason you are unable to fly, ToNiagara will issue a FULL REFUND. If you need to change/cancel Helicopter Tour dates please call or email us. For any time lost on the tour or change in passenger vehicle. If the tour is cancelled due to bus/vehicle breakdown ToNiagara will be provide a full refund. 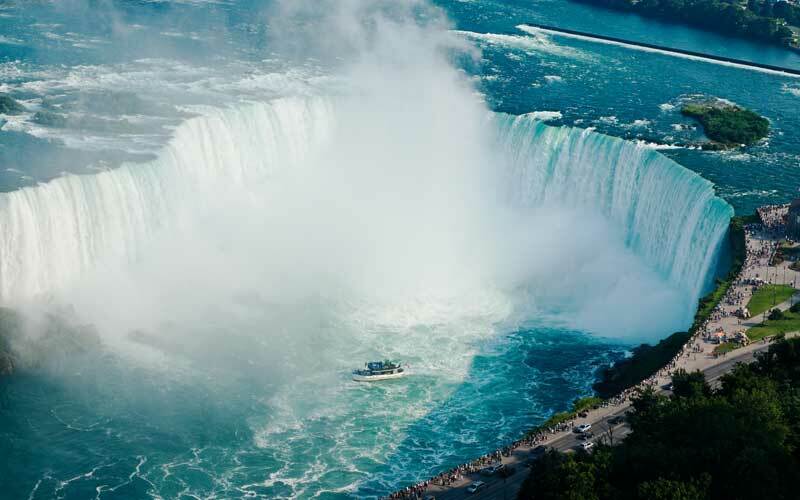 Voyage to the Falls Cruise (Daytime): A full (100%) refund will be provided by ToNiagara for any cancellation request received at least 24 hours before the scheduled departure time. Any cancellation within 24 hours of the scheduled departure time will receive NO REFUND. Falls Fireworks and Illumination Cruise (Evening): ALL Evening Cruise tickets have limited seating. Tickets must be booked at least 14 days in advance. Tickets for Evening cruises are NON Refundable. Free rescheduling of tour date (reschedule is subject to availability). NO REFUNDS are provided for any tours with an Airplane Trip component, unless inclement weather results in tour cancellation or the tour operator cancels the tour, in which case a FULL REFUND will be provided. I want to purchase a ToNiagara Tour as a gift, how does that work? Purchasing a ToNiagara Tour gift is easy! Simply scroll to the bottom of any page and select the "Gift A Tour" button. Then purchase whichever gift is appropriate. A voucher code is sent to you which your loved one will use when he/she is ready to book a tour. That's it! Fast and easy! If I purchase a Gift but don't use it do I get a full refund? Yes! A full refund will be processed to the credit card used the make the payment (please allow 3-5 business days for payment to appear on your credit card statement). Can we drink alcohol or smoke aboard the tour vehicles? Smoking and consumption of alcohol onboard any of our vehicles is prohibited, though charter groups can store unopened alcoholic beverages in the luggage bays for consumption at their destination. Exception: If you are hiring a party limo for a private tour. What type of vehicles do you have for Custom Tours? We have a fleet of vehicles ranging from 1-4 passenger Lincoln Town Cars to luxurious 56 passenger Coach Buses. We can accommodate any group of Tour goers in style. Can I do a custom tour for my Bachelorette/Bachelor Party or for couples date night? Yes, we will suggest some fun places to go, just let us know the size of group you have and any preferences, you'll have a great time in Niagara Falls! Yes. Please inform us upon booking your tickets that you require wheelchair access. Call 1-800-653-2242 to make arrangements. What payment methods do you accept for the Niagara Falls Tours? We accept online payments via Visa, MasterCard and Amex (American Express) credit/debit cards for all Niagara Falls Tour Bookings. I have an infant. Do you supply Child Carrier Seats?